I was just 16 years old when the this tan kid with the hair fade entered my life. He really hasn't changed much except for looking older. Today, Derek Jeter turned 35. He was the 1996 Rookie of the Year and won his first World Series that year. He got World Series championship rings again in 1998, 1999 and 2000. In 2000, he was named the All-Star game MVP and World Series MVP. There's never a time, even after all these years, that Jeter does not quit. It's one of the reasons he has been my favorite Yankee since 1996 and why I continue to chase his cards. As of Jeter's 35th birthday, I have 1,361 unique cards. Many of them with the help of fellow bloggers who are willing take my Red Sox, Braves and any other card that doesn't have Jeter or Kouzmanoff on here. 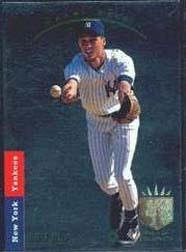 In a short while, I am going to upload some of my favorite Jeter cards from my collection. he's only 35? He plays a lot older that that, I assumed he was older. This coming from a guy who idolizes a senior citizen 3rd basemen. He was at his prom when Jeter was born.